Under existing Noise Pollution and Motor Vehicles Rules, citizens may apply to have their residential or mixed areas declared as Silence Zones/No honking Zones. Under this application, after consultation with residents, please notify the area from Reshma Apartments to Parishram Apartments, Nargis Dutt Road, Bandra West as Silence Zones/No Honking Zones. According to the interpretation of the State Government, Silence Zones were de-notified in September 2017 and now, several months later, there has been no action to protect citizens from noise pollution due to honking and other noise sources. When Awaaz Foundation recently measured noise from traffic in Bandra, the decibel level of horns reached a maximum of 107 db, causing inconvenience and health problems to all of us who live on roads with vehicular traffic. Under provisions of the Notification dated 31st July 2014 of the Maharashtra State Environment Department entitled ‘Standards for Horns, Sirens and Multi toned Horns for the Vehicles plying in the State of Maharashtra and their Use’ (“Vehicular Horn Rules”) and of the Noise Pollution (Regulation and Control) Rules 2010 (“the Noise Rules”) as amended by the Ministry of Environment, Forests and Climate Change (MoEFCC) on 10th August 2017, the portion of Nargis Dutt Road, Bandra West including the residential buildings Reshma Apartments, Imperial Heights and Parishram may be declared as a ‘No Honking Zone’ and ‘Silence Zone’ after a process of due public consultation. “5. Irrespective of the norms stipulated in 1,2, and 3 above, following areas on the State of Maharashtra are declared as “no honking zones/areas” wherein any kind of honking from the motor vehicle is prohibited at any given time except during extreme emergency situations. According to the Government’s interpretation of the Noise Rules amended on 10th August 2017, Silence Zones earlier identified and declared by the BMC are no longer in operation as they have not been specifically notified by the State Government. In the period from August 2017 till date, Silence Zones have remained unprotected from all noise sources , causing great hardship to residents of Mumbai. Silence Zone Rules were first implemented in 27th September 2003, when the Bombay High Court ordered the police to verify and certify before granting any loudspeaker permissions in a Silence Zone as defined under the Noise Rules. On 18th July 2005, the Supreme Court of India ordered other noise sources such as honking to be added to the prohibitions in Silence Zones. In February 2009, the Court ordered the Government to identify and put up Silence Zone boards within one week. The Ward offices of the BMC identified more than 1200 Silence Zones in Mumbai and put up boards on site. Citizens and citizens’ groups also participated in the exercise of identification through interaction with their local Ward offices. The area for which this request for a Horn Free Zone and Silence Zone is a mixed Residential/Silence Zone area on Nargis Dutt Road, Bandra West, where the Government may declare a Silence Zone after public consultation. Awaaz Foundation strongly objects to the increase in decibel levels of sirens in Mumbai from 100dB to 120dB. We appeal to you, on behalf of critically ill patients using ambulances as transport to hospitals to consider the ill effects of intolerable noise levels. We also to appeal to you on behalf of other residents of Mumbai whose health would be jeopardized by such high noise levels on our streets. The proposal to increase ambulance siren noise levels to 120dB is dangerous to the safety of the patient inside the ambulance and to the hospitals and other Silence Zones placed along roadsides. It is also dangerous to residents of nearby areas who may be in vulnerable situations including elderly people and children. High noise levels would constitute a safety risk to traffic as noise affects mental health and could result in increased road rage. It would also place already vulnerable traffic police at risk of adverse health effects and jeopardize their ability to enforce traffic discipline. International studies indicate that it is unsafe even for healthy people to be exposed to 120dB of sound for more than 7 seconds. It is far more dangerous for critically ill patients to be exposed to such high noise levels. Noise adds to stress levels. Exposure to such dangerously high noise in rickety ambulances without any sound insulation through jammed Mumbai traffic could even result in the death of a patient struggling to receive medical care. Doctors and nurses will not be able to communicate inside these ambulances to provide health care and the added stress can mean the difference between life and death of critically ill patients. The Indian Noise Pollution Rules are based on the World Health Organization Report “Community Noise” which states that area around hospitals should be defined as Silence Zones so that patients are not exposed to noise pollution over 50 dB in the daytime and 40dB in the nighttime. An ambulance, which operates as a patient care center during transport to hospital is also in need of insulation from sound similar to a hospital. Most ambulances in Mumbai, unlike those in the U.S. do not have any sound insulation. Awaaz Foundation has measured noise levels from sirens in London and Mumbai. The measurements in Mumbai were carried out along with the Maharashtra Pollution Control Board in 2014 and maximum decibel level was 100dB. The measurements in London were carried out in May 2017 and maximum decibel level was 94dB. Hon’ble Minister Shri Ramdas Kadam, on behalf of citizens of Mumbai who are already suffering the ill effects of high noise levels on a daily basis in our city, the noisiest in India according to a Central Pollution Control Board study, we appeal to you to consider the long term ill effects on our collective health. In particular, we request you to consider the effects of dangerously high noise levels on critically ill patients inside an ambulance on their way to hospital. We sincerely request you to withdraw this proposal immediately. Subject: Please control Mumbai's noise pollution. World class cities like London, to which we sometimes aspire, do! During a recent visit to London, I measured noise levels at various locations and compared them with noise levels in Mumbai. I measured noise near six central London hospitals, in two London residences, at construction sites and in trains including overground and underground trains and compared the findings with corresponding locations in Mumbai. Recommendations: The decibel levels of horns and Silencers of vehicles need to be checked while undergoing registration formalities and through enforcement drives. Drivers need training to drive without honking and enforcement of anti-honking rules needs priority. Honking near hospitals need special enforcement drives and we need to consider insulation of hospital premises. Ambulances too should consider lowering decibel level of sirens, particularly in light of the fact that Mumbai ambulances are not sound proofed, while critically ill patients requiring silence are treated within. Ambulances while transporting patients often act as mini hospitals and should aspire to the same level of silence as hospitals, which are Silence Zones. Residences in London and Mumbai: Even when situated on main roads , London residences are so quiet that they measure under 30dB in the daytime. The readings include a residence with double glazed windows which measured 29dB indoors and another one with ordinary single glass, which measured 35dB in the daytime. Again, although the roads carried traffic, the London residences were quieter than Mumbai due to the absence of honking on the streets. Mumbai residences measured during 51dB and 90dB in various seasons and depending on the sources of noise, including honking, loudspeakers etc. in their vicinity. Recommendations: Honking in Mumbai along with all types of noise including loudspeakers, firecrackers and other noise sources need to be restricted in Mumbai’s residential areas at all times. Construction sites: The noise from construction equipment was similar in London and Mumbai, with a maximum decibel level of 101.4dB while cutting stone in a London suburb and 89.7dB at a major building construction site. In London. However, I understand that timings that such work is permitted are very strictly regulated in London and I observed noise barriers around the London sites while no such barriers exist in Mumbai. Construction is permitted in Mumbai for much longer hours than in London. Recommendations: Timings for construction need to be restricted and an action plan to mandate noise barriers and restriction on types of construction activity permitted/not permitted in situ needs to be formulated and notified. Overground and Underground trains: The decibel level of trains in London and Mumbai were similar with maximum decibel levels on a London underground station measuring 74.1dB and inside a train measuring The overground trains too measured similar decibel levels. The trains in Mumbai were similar to those of London on both Western and Central Line suburban trains, but exceeded decibel levels by far when announcements were made upto 88dB, when brakes were not maintained and made a screeching sound upto 94dB and when horns were used upto 120dB. Recommendations: Maintenance of trains to restrict noise levels from faulty equipment/mechanics needs priority. Additional noise sources such as loudspeakers within trains and bhajan mandals need to be strictly regulated. Hon’ble Chief Minister, noise pollution is a serious environment pollutant adversely affecting the health of Mumbai residents. London is a major city comparable to Mumbai in many ways, and one which we often aspire to emulate. Noise levels have been controlled there by regulating timings of noisy work, ensuring that essential services and activities such as trains, construction and traffic do not create unnecessary noise. There are also strict laws governing timing and location of recreational events which do not permit many types of activities including loudspeaker use except in designated areas. In spite of this, London is considered a noisy city and residents of London complain about the adverse effects of noise pollution. The noise levels in Mumbai far exceed those in London due to lack of enforcement of laws and planning to control noise pollution, from traffic, construction and recreational use. Essential services such as trains also add to the noise pollution, making Mumbai one of the noisiest cities in the world. All of these noise sources could be reduced by effective political and administrative will, which would safeguard the health of crores of Mumbai residents. We request you to consider the harm caused by these high noise levels on the health of our citizens and residents of Mumbai and to take effective action to control decibel levels from all sources in Mumbai. Noise levels in vicinity of Central London Hospitals compared with Mumbai hospitals. The noise levels in the vicinity of six Central London hospitals was measured on a typical working day in May 2017. All hospitals are located on busy roads with heavy level of traffic, Readings were taken on the street outside and in the entrance lobby. Maximum noise levels were noted over an elapse period of several minutes for each reading. The noise level on the outside ranged from 62 to 88 dB. Inside the lobby the range was 56 to 74 dB. 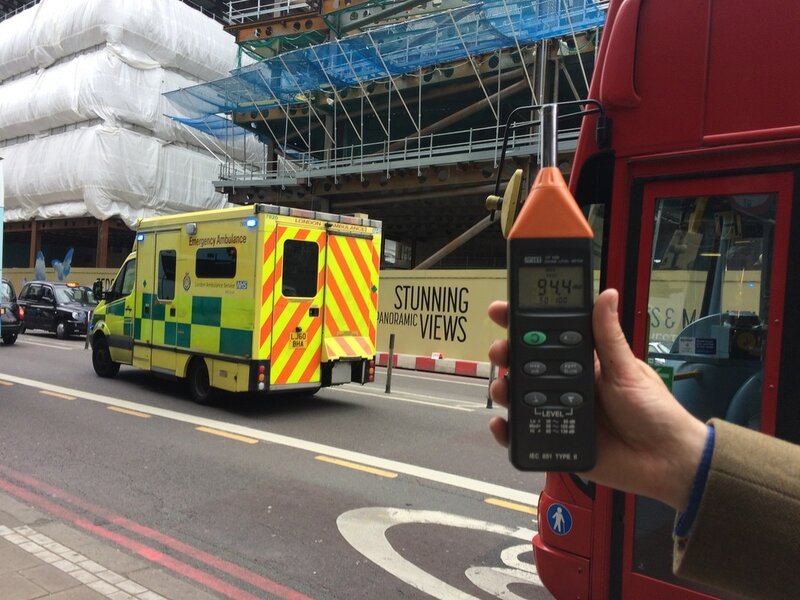 Noise levels of passing ambulances with their sirens on were also measured; the highest was 94 dB. Noise levels measured in the vicinity of six Mumbai Hospitals on a typical working day in May 2017 ranged from 95.1dB to 100.5 dB. Noise level of an ambulance in Mumbai was 100 dB, measured with the Maharashtra Pollution Control Board in 2014. The highest noise levels in London and in Mumbai was from traffic on roads outside the hospitals. In London, the sound was mainly of vehicles without horns and the maximum levels was 88dB. In Mumbai, due to constant honking, even the site where the lowest level of 95.1dB was recorded was higher than the highest in London. Maximum recorded level was 100.5dB. The decibel level of the ambulance was also higher in Mumbai at 100dB compared to 94dB in London. I draw to your kind attention various Orders of the Hon'ble Supreme Court of India and the Bombay High Court which specifically disallow use of any sound producing instruments after 10 pm. The Supreme Court Order dated 17th July 2005 states in Directives II Loudspeakers: "No one shall beat a drum or tom-tom or blow a trumpet or beat or sound any instrument or use any sound amplifier at night (between 10pm and 6am) except in public emergencies." The Hon'ble Supreme Court's Order of October 2005 relaxes the time limit for loudspeaker use only, by allowing the State Government to notify a limited period of 2 hours (upto midnight) for a period not to exceed 15 days a year. Subsequently, this was further relaxed to allow the State Government to notify 12 days a year and 3 days at the discretion of local authorities. The Hon'ble Bombay High Court has also re iterated the implementation of Supreme Court Orders from time to time. I hereby submit that any permissions for time extension beyond 10 pm for any instruments other than loudspeakers only would be in violation of the directives of the Hon'ble Supreme Court and the Bombay High Court and may be withdrawn immediately. will confirm that during the extended time period 10pm to midnight, noise levels significantly exceeded permissible decibel levels. THe maximum recorded was 105 dB with loudspeakers and with use of traditional instruments but without loudspeakers, reached a levels of 88dB, which still far exceeds the maximum permissible limit after 10 pm. Awaaz Foundation will measures noise during the Ganpati Festival and periodically during the entire festival period 2012. Honking is more than just a nuisance. Noise pollution has a direct and severe impact on health, resulting in deafness, heart disease and mental health issues for residents of most Indian cities. Honking in Silence Zones, near hospitals, schools, courts and religious places is particularly harmful and can even make the difference between life and death sometimes. The Supreme Court ruling of 2005 against noise pollution started with a news story about a 10 year old girl who was raped and whose cries for help could not be heard due to noise. A deaf school in Mumbai reports cases of infants exposed to firecrackers becoming permanently deaf. A case was brought to our notice where a senior citizen exposed to loud noise died of a heart attack shortly afterwards. Indian laws do not restrict the decibel levels of horns permitted to be installed within vehicles but restrict only the use of horns in certain designated areas. The Rules are mostly ignored due to lack of awareness or willful defiance of Law, making Indian cities the noisiest in the world. In the absence of laws restricting decibel levels of horns, foreign car manufacturers are vying with each other to make noisier and nosier horns, often manufactured ‘extra loud’ for Indian imports. Awaaz Foundation was a Member of a Committee appointed by the Maharashtra Pollution Control Board to suggest maximum permissible decibel levels of horns. After consideration of our recommendations, the Central Pollution Control Board recommended maximum permissible levels for horns. We request your personal intervention to notify this recommendation and implement it for all vehicles nationally, including imported vehicles. Noise mapping is being carried out in the city of Mumbai near some proposed road projects and around airports, to restrict noise levels. Due to excessively high noise levels, sound barriers have been built near some new road projects. There is a need for sound barriers on several other new infrastructure projects and a need to identify the location of these sound barriers. Other noise mitigation measures could also be proposed around other noisy sites including near railway lines, airports, entertainment and cultural venues. Noise mapping is the established way to determine existing noise levels, project noise from new infrastructure projects and suggest mitigation measures. In the UK, NGO/Government partnerships like defra maintain noise maps using LIMA interactive software. Thee maps, easily accessible to citizens, policy makers and urban planners are a useful tool for determining noise levels at safe limts. Awaaz Foundation requests that noise mapping should form a part of urban planning for all Indian cities, starting with major metropolitan areas like Mumbai and Delhi. Indian cities face a serious crisis in finding space for recreational, cultural and political activities. On the one hand, there is a legitimate need for conducting various open air concerts, cultural and religious festivals and political activities. On the other hand, cities are densely occupied by residential spaces and even more sensitive areas designated ‘Silence Zones’ like hospitals, educational institutions etc with a need to maintain quiet. It would be useful to demarcate areas on the outskirts of these cities as designated venues for all such activities and to ensure that no residential or sensitive installations are allowed near these areas. This is a normal practice in many Western countries where concerts are held in designated open air venues away from the congested parts of the city. There is an urgent need to build these venues into urban planning during the next phase of development of Indian cities. Convenor Sumaira Abdulali, Volunteers Laika Abdulali, Faiz Abdulali, Shlok Paul and Rahil Kakar presented against noise pollution to the Chief Minister, Maharashtra Shri Prithviraj Chavan on World Environment Day 2014. The Chief Minister signed a pledge to take all action against noise pollution. Ref: News items in various newspapers that restaurants would be allowed to operate 24x7 in Mumbai. Citizens and citizens’ groups have objected in the past to the BMC about specific restaurants which create noise pollution at night, particularly in Bandra West and Khar. These restaurants and pubs create noise both directly and indirectly, through loudspeakers used within the restaurant, through honking and shouting in the streets while their patrons depart late at night and open-air cleaning of vessels. Residents have also complained of allied issues including law and order issues when restaurants are open late. We strongly object to a new proposed amendment to the Shops and Establishments Act, recently passed by the Maharashtra State Legislature, to allow restaurants to remain open throughout the night, apparently for the benefit of visiting tourists. Stakeholders including citizens’ groups were not consulted prior to this decision and the Noise Pollution Rules and allied court orders were also not considered. It is not clear how 70% of residents would offer their consent to the operation of any establishment, given that the noise from traffic spreads a considerable distance away from the establishment itself. In any event, the State is bound to protect the health of the other 30% who might be in a vulnerable condition would be impacted. Residents’ health cannot be given a lower priority than the enjoyment of tourists and this would be specially relevant in the thousands of Silence Zones of Mumbai. No horn should be allowed to be used at night (between 10 p.m. and 6 a.m.) in residential areas except in exceptional circumstances. 1. There is a need for creating general awareness towards the hazardous effects of noise pollution. Suitable chapters may be added in the text-books which teach civic sense to the children and youth at the initial/early level of education. Special talks and lectures be organised in the schools to highlight the menace of noise pollution and the role of the children and younger generation in preventing it. Police and civic administration should be trained to understand the various methods to curb the problem and also the laws on the subject. 2. The State must play an active role in this process. Residents Welfare Associations, Service Clubs and Societies engaged in preventing noise pollution as a part of their projects need to be encouraged and actively involved by the local administration. The abovesaid guidelines are issued in exercise of power conferred on this Court under Articles 141 and 142 of the Constitution of India. These would remain in force until modified by this Court or superseded by an appropriate legislation. 1. The States shall make provision for seizure and confiscation of loudspeakers, amplifiers and such other equipments as are found to be creating noise beyond the permissible limits. 180. Though, the matters are closed in consonance with the directions as above issued in public interest, there will be liberty of seeking further directions as and when required and, in particular, in the event of any difficulty arising in implementing the directions. The MMRDA is in the active process of preparing the Development Control Map and Rules for Mumbai. Noise pollution is an important factor while determining placement of various infrastructure and establishments and it would be appropriate to take noise into account while permitting any change in Rules which would affect noise pollution levels in Mumbai (already the noisiest city in the world). Therefore, any decision to allow them longer hours for certain establishments can only be determined after a thorough planning exercise including a noise map. It has been proved beyond any reasonable doubt that the presence of an establishment such as a restaurant or pub in a Silence or Residential Zone would lead to increased use of horns and consequent noise pollution. Citizens and citizens’ groups have actively represented against such noise pollution. I request that the decision to allow restaurants and pubs to remain open all night, which presently rests with you, should be taken in accordance with the direction of the the Hon’ble Supreme Court of India. No restaurnats/pubs should be permitted to remain open all night in any Silence or Residential Zone of Mumbai.